First, install the extension just like any other plugin. If you need assistance with this, refer to the FAQ. Once installed, go to Downloads > Settings > Payment Gateways. Purchases made with 2checkout will send customers to the 2Checkout website where they will complete the purchase. Purchases made with 2Checkout Onsite will keep customers on your website and allow them to enter their credit / debit card details on the checkout screen. Note: this option requires that you have an SSL certificate installed on your website. 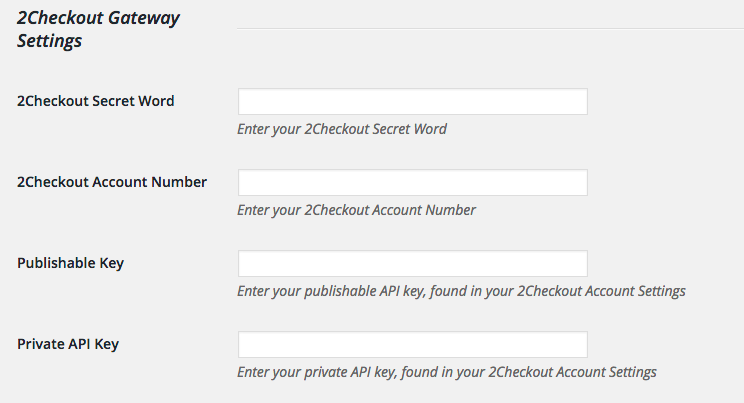 From your 2Checkout account, your account information is located under Integrations / Webhooks & API. Note: The 2Checkout Account Number is labeled as the Merchant Code in 2Checkout's settings. The Publishable and Private API are only needed for on-site purchases with credit / debit cards. Important! If INS is not properly configured, purchase processing will not work. 2Checkout's Instant Notification Service allows 2Checkout to communicate with your store, keeping transaction data in sync. INS must be set up properly for purchase processing and recurring billing to work. Note: Please replace "example.com" with the appropriate name of your website. Note: In 2018 2Checkout updated their user interface, it's possible some settings were changed/updated when the update occurred. If anything is not working as expected, review all settings in this document and Recurring Payments - 2Checkout Gateway Configuration. If you've had an account prior to the new interface, it's likely some settings need to be updated to work properly. If you find that your INS requests are failing, make sure that you're using the same protocol for all requests. For example, if you make your request via HTTP, but then require HTTPS for incoming requests (from 2Checkout for example) then they'll fail, since they don't match. This notice can happen when the billing address is not filled out. The billing address is required, so hiding or removing it will cause the transaction to fail. 1. Your 2Checkout account has not been fully approved. Contact 2Checkout's support team to confirm and to fully activate your account. 2. Not all required fields are being sent to 2Checkout. This could happen if you have removed the billing address or other required fields on the checkout form. To resolve the problem, restore the fields that were removed. Can customers update their credit card information? No. If you have a customer setup on a subscription, 2Checkout does not currently allow them to update their credit card information. Additional information is available on the 2Checkout website.